確實找到 base board上的 兩個 I2C Device ( LM75 0x9E 以及 BMA250 0x30 )的 Slave address. 這邊使用一個 loop 依順序,從 0x02 每次加上 2 (只檢查 write) 做 Slave ack 確認. 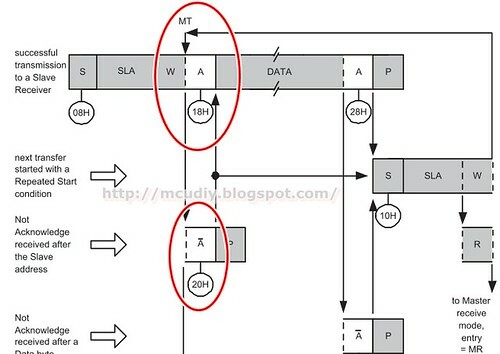 若有 ack 反應就判為 I2C Bus上存在這個 Slave address. 試試看你的 I2C Bus 上有哪些 slave device 吧..
我讓 LPC1343 模仿 EEPROM 24C16 當 I2C slave device, 結果 連續接收二筆資料,第一筆常會丟失, 但第二筆則是穩定正常.